Blitz crafting! In a challenge to make a door hanger in 30 minutes or less, we created this by repurposing a cardboard box, some scrapbook paper, glue, and glitter. You can make yours to say whatever you like—Happy Holidays, Merry Christmas, etc. 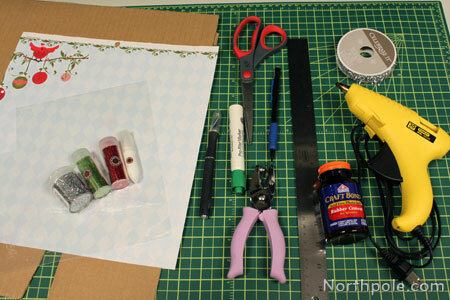 Place cardboard on the cutting mat and cut a piece that is 10.5" x 5.5", using an X-Acto. Create small holes about 1" inside each corner. Poke a hole using the X-Acto, and spin the knife in place to enlarge it. Measure and cut paper so that it’s the same size as the cardboard. 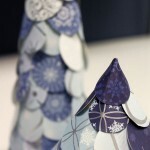 Lay paper on the cardboard and use a pencil to mark where the hole should be. 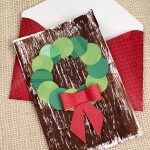 Set cardboard aside and use a one-hole punch to make holes in the scrapbook paper. Cut a piece of the�transparency sheet that is 2.5" x 1.5". You can make yours larger or smaller, if you like. Use scissors to round off the corners. Set aside. Cut a piece of ribbon that is 18" long. Set aside. Lift top edge of paper and apply hot glue near the top edge. Press paper in place. Use caution as the glue is very hot. Continue to glue down paper. Let dry. Note: If you prefer not to use hot glue, you can use rubber cement. With a pencil, lightly write the words that you want. Lay newspaper on a flat surface. Place cardboard/paper on newspaper. Using fine tip glue applicator, trace over the words written in pencil. 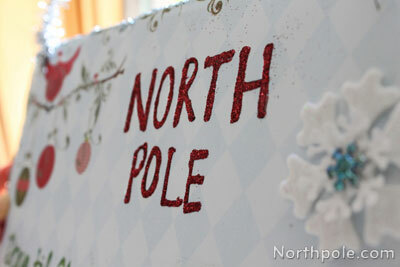 If you are using two different colors of glitter, only write the words that will be in red (e.g. 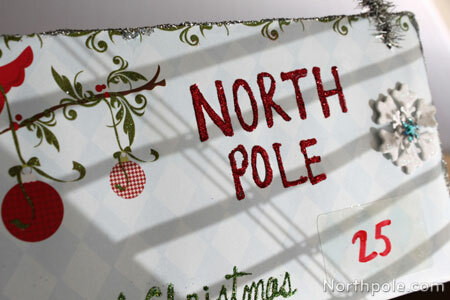 North Pole), apply glitter, and return excess to container. Write remaining words in glue, apply green glitter, and return excess glitter to container. To simplify this step, simply write words with glitter glue pens. Use rubber cement to adhere the piece of transparency to the paper. String ribbon through the holes and tie a knot. Trim excess ribbon, if desired. Pour a mound of glitter on newspaper (about 2–3 tablespoons). Working in small sections, (3–4 inches at a time) apply a line of hot glue along the edge and immediately dip into glitter. Repeat until all edges are covered. We prefer hot glue over white craft glue for this step because it dries (cools) almost instantly. 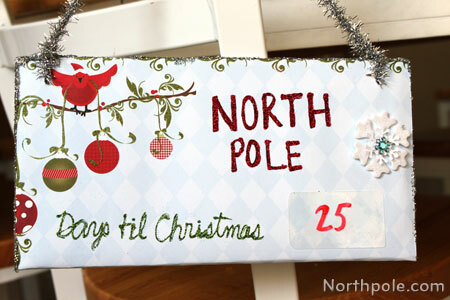 Use a dry erase marker to write the number of days until Christmas.